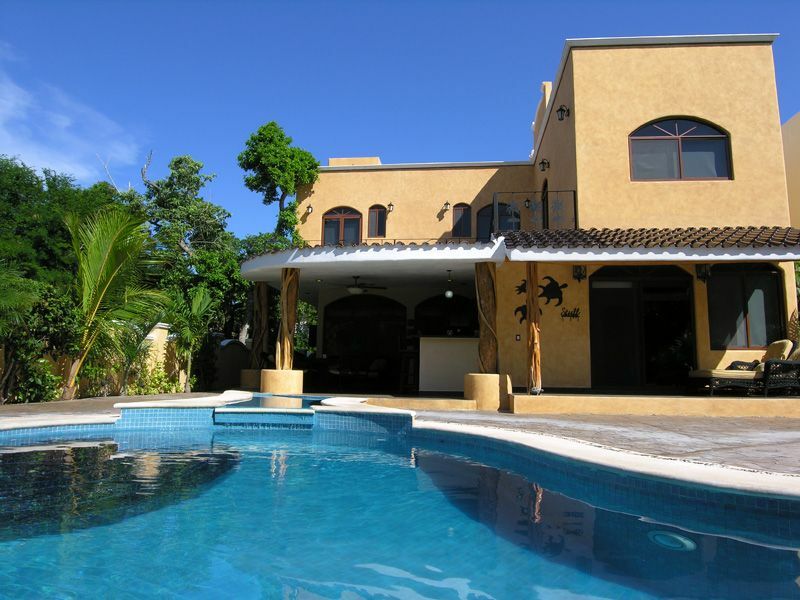 Villa La Vida Loca is a private, residential vacation rental home located in Playa del Carmen, Playacar Phase 2 only a few minutes walk to beach and town. Located on Retorno Akab Uno at the end of a cul-de-sac the house is peaceful and quiet, with lots of room for entertainment. Beautifully designed and executed by local craftsmen, Villa La Vida Loca has 5 bedrooms and 6.5 bathrooms, a den with 2 full futons, an office with internet and a sofa bed, several terraces, and a private yard with a giant pool. The palm tree theme is evident everywhere - from the carving on the front door to the unique wrought iron railings. Enter into the grand foyer, with a view through dining and living room with TV right out to the pool. The outdoor area is very private, with a Spanish design wall and mature landscaping everywhere, leading to an intimate green space for hammocks in the shade on the other side of the waterfall. Two covered outdoor rooms surround the pool, with an outdoor bar and grill area to supplement the full kitchen with eat-in island. The master bedroom with king sized bed and TV overlooks the garden and pool area. A double cushioned lounger on the terrace off the master bedroom provides a romantic spot to nap or read a book. The four upstairs bedrooms radiate off the library with 2 double futons. Three of the upstairs bedrooms have king sized beds, and one bedroom features two queen sized beds. Each bedroom is outfitted with high quality mattresses, linens and towels and its own private bathroom. Three bedrooms have direct access to the L shaped terrace and the front bedroom has its own balcony. The office has a curved sofa that extends to make a circular bed and its own flat screen TV. A full bathroom is just off the foyer. On the roof top terrace you will be able to catch sunrise or sunset. A second bar area with built-in seating, dining area and a half bath make this a great place for entertainment. This is a special property - perfect for adult gatherings of friends or family. Children under the age of 10 will be considered on an individual basis. Rates are based on 12 guests. Additional fees apply for extra guests. Maid service three times a week is included with your weekly rental. No maid service on Sundays and public holidays. Additional maid service is available upon request for an additional fee. As well included with your rental are drinking water, sheets & towels, beach towels and basic supplies like toilet paper, paper towels, tissues & soap. We will meet you shortly after your arrival to make you feel right at home and answer any questions you may have. As your local property manager we offer 24/7 emergency assistance and can help you arrange for ground transportation, catering, in-house massages and open van service. Inside dining table seats 8, outside area with dining table seating 6, bar with 3 bar stools, sofa and chairs with coffee table. We stayed for a week with 4 adults and three children and had a wonderful time. The house is beautiful and spacious and has everything you need. We especially loved the covered outdoor area and rooftop. Dan and Mariana were so helpful with anything we needed and getting groceries etc. the maids are also so nice and efficient. We used the chef Beth (loved her!) 3 nights and would highly recommend. Easy safe walk to town. The beach was a little harder to get to than we expected (we had a stroller) as you have to walk off the beaten path for a bit but it was manageable. Overall would highly recommend this house! Surpassed expectations. Very quiet and relaxing. The home was absolutely beautiful! Our family had a wonderful time at Villa La Vida Loca. The home was beautiful and the staff that maintained it was wonderful to work with. Its location with proximity to the beach and town was great. We had many great walks to both! We also can not say enough good things about Claudia and Dan, they both were absolutely wonderful to deal with. We will definitely be back. This villa was super beautiful and very spacious for the group of us nine friends. Claudia Hocher helped answer and questions i asked leading up to getting there. Dan the property manager greeted us right off the ferry from Cozumel and got a ride transportation to the villa. He then did a great job running through the things about the house, and was just a phone call away if we needed anything. We had such a great stay. The outside pool and bar were amazing and where we spent a lot of time. The rooftop was also a very cool spot. The kitchen had everything we need to cook meals when we stayed in. The villa was pretty secluded and felt safe all the time. The walk to the beach and to town were not bad at all. The maids came about every other day and stayed out of our way but yet helped keep the house super clean. The pool and Gardner day a great job as well. I would recommend this house to anyone especially with a larger group as people. Wonderful house in every way! We absolutely loved our time at this wonderful vacation home. There was plenty of room for our three families and everyone had their own space, plus lots of common areas to hang out. The pool area is incredible - everyone LOVED the pool and there are sunny spots to get a tan and also lots of shade for those are sensitive to the sun. Dan and Claudia are great hosts and even helped us arrange a caterer for one night - INCREDIBLE meal - we did the Mexican Fiesta - highly recommend! They also helped some in our group arrange for airport transfers and were just wonderful. We've been to Mexico many times and this is by far our favorite rental house...we'll be back! This place is the ultimate vacation getaway for a bigger group. Management was on point and professional. They organized round trip transportation that was timely friendly and efficient as well. I will definitely use their services again in the future. The Yucatan Pensinsula is home to ancient Mayan Ruins in day trip distance. The most visited are Tulum, Coba and Chichen Itza. Rates are for seven nights in USD excluding 19% Tax and based on 12 people including children of any age. Add 280 USD per person per week for up to the maximum of 16 people.